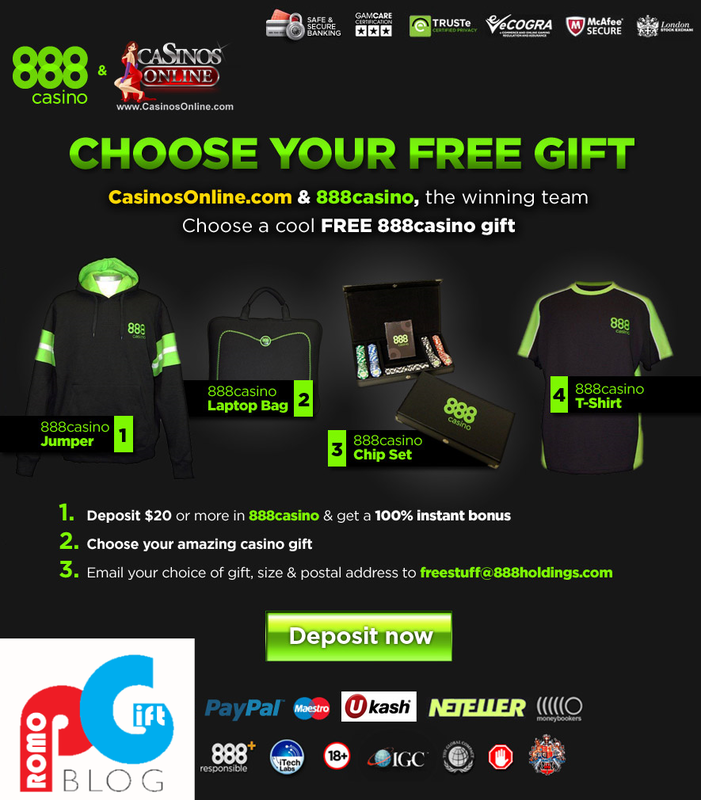 The popular online casino, 888, are currently running a promotional campaign - in which they provide a free gift when customers deposit $20 or more into the casino. After depositing, the customer will then have a chose of a free item, including, a hooded jumper, a laptop bag, a T-Shirt and a poker chip set. The most important aspect of all these gifts is that they're branded with the 888 logo, and they match the casinos color scheme, to make it more recognizable. 888 chose to give away these specific promotional gifts as they are likely to be used in public. The hooded jumper and T-Shirt will likely be worn in public, the laptop bag will likely be carried in public and the chip set will be used when customers play games of poker with their friends. This public exposure is certain to do one thing; increase brand awareness and get more consumers using 888 as their casino of choice. The free gifts add a huge incentive to consumers to deposit their money into the casino, where the casino is more than likely going to win. So despite the fact 888 may lose a small amount of money on the promotional gifts, they will earn it back from those who deposit into the casino eventually. The products they've used for this campaign are all relatively generic, which means this type of campaign can easily be run on a tight budget. As you can see from the image, they have also linked it to another casino website, CasinosOnline, who they are likely in partnership with. So not only does this campaign add brand awareness, it also helps to drive website traffic, as this campaign was run online. Im Zusammenhang mit unserem letzten Punkt, sollte jeder gute Casino-Spieler wissen, die Chancen der Spiele automatenherz.com, die sie spielen wie die Rückseite ihrer Hand.